"I know it's not normal, but I can't help it." They surround you everyday. They are in everything�the water you drink, the food you eat, the air you breathe. Over 60,000 of them are in use on a daily basis. They are chemicals, and our immune systems are bombarded by them constantly. Some are more obvious than others: the car exhaust on the freeway, hairspray, the scent of a man marinated in after shave, and second hand smoke (alone containing 4,000 different varieties, 42 of which are toxic, including formaldehyde and Benzopyrene, one of the world's most potent cancer-causing chemicals). Others are not so obvious�your shampoo, your cereal, the fabric of your clothing. So what happens when the immune system simply can't handle it anymore, when the environment itself becomes toxic? Writer/director Todd Haynes (Velvet Goldmine, Superstar: The Karen Carpenter Story) chose the topic of environmental toxicity for the theme of his 1995 film. With the discovery of AIDS, a new awareness about the importance of the immune system came to light, but many new diseases—often misunderstood in conventional medicine—are attributable to the body not being able to cope with the environment it lives in. What do you do when your environment is killing you? Where can you go to feel Safe? Julianne Moore is Carol White, a housewife in a new subdivision in an afluent area of the San Fernando Valley. Inexplicably, she begins feeling ill, a bloody nose, dizziness, nothing that her doctor can attribute to anything but stress. With nothing physically wrong with her, she is given some medication, told to cut back on dairy, and get off the all-fruit diet she has just gone on. Her husband (Xander Berkeley) doesn't understand, and when her condition doesn't seem to go away, she is recommended to a psychiatrist. Is this all in her mind? After aerobics class she notices a bulletin posted describing her symptoms, and pointing the finger at the chemicals in her environment. When she collapses at her drycleaners and is hospitalized, she decides she must go to a clinic she's seen on TV, a place where people overcome by the toxins in their environment can go to begin the cleansing process: a place where she can be safe. Located in the middle of the desert, she arrives at the clinic run by Peter Dunning (Peter Friedman), a man who also has an immune deficiency, and is suffering from AIDS. The people are bonded by their shared afflictions, and the adversity they face from the outside world. Their road to recovery begins with looking within themselves, but are the external forces the only thing making them sick? While the subject is a laudible one, the execution of this film is certainly not. The pacing is excruciatingly slow, and the characters completely unlikeable. Moore's character is a wealthy nobody, boring and retracted. Her husband is equally banal, and not the least bit sympathetic. The first half of the film is painful to endure, and just when you thought it couldn't get any worse comes part two, with extended diatribes on self-healing as Haynes switches tracks to turn the film into an examination of new age groups. The only saving grace in the entire film is the appearance of Jessica Harper (Phantom Of The Paradise), but even she gets lost in this plodding wasteland of a film. While the choice of using static master shots for framing the majority of the film is interesting in concept, composition ends up being huge expanses of ceilings where the characters are overwhelmed by their surroundings�thematically correct, but practically, distracting. Dialogue is often completely forced and out of the blue�one scene has Carol finding out about the sudden death of her best friend's (Susan Norman) brother. Her first question (which we can't hear, so loses the whole reason for the scene) is whether he had AIDS, not whether it was a car accident or some other normal catastrophe. Surely she would know something like that if her friend's brother were dying. Where did this come from? A few scenes are well played, but they tend to drag on forever. Haynes mentions in the opening of the commentary that the idea for the film came to him while stoned, and I suggest being heavily sedated may be the only way to actually enjoy sitting through this one. Image Transfer Review: The image here is very soft, and is also purposefully dark; this means characters are often lost to shadow and low level detail is simply not present, especially on interior shots. Fine grain is well rendered, and print defects are minimal. If not for comments about the look of the film from the director, I would not have found this very acceptable, epsecially give Columbia's generally high quality presentations. By contrast, the trailer also on the disc features a much better video representation, though a bit overly bright. Also, Columbia has strangely decided to subtitle two areas of onscreen text in the film, one is a poster; the other wording on TV, despite both of these being read orally. Audio Transfer Review: Audio is presented in Dolby ProLogic, and for the most part is clear and dialogue is easy to understand, since the sound design rarely utilizes the score. However, audio does present a problem in one establishing scene when the line that is to open the audience awareness of immune deficiencies is obscured by room noise. Ed Tomney's score is another saving grace of the film, however it is missing most of the time, leaving agonizing gaps between the dialogue. Extras Review: Safe features a scene-specific commentary from director Tood Haynes, actress Julianne Moore (seeing the finished film for the first time), and producer Christine Vachon. This is your typical group lovefest, each person commenting on how great the other was, and so forth. We do learn a few important facts about what the picture was supposed to convey; things that were not evident in simply watching it. We do get a running location update outlining just which of Haynes' relatives' homes we were in for each shot. 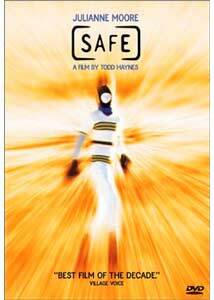 Full-frame trailers for Safe and The End Of The Affair (1999) are present, as are single screen filmographies for Haynes, Moore, Xander Berkeley and Peter Friedman. There are also printed production notes from Haynes, though his views on what he has accomplished with the film do not mesh with my experience at all. You know the feeling when time seems to be passing incredibly slowly, like when you're at the dentist's office getting a filling, or waiting in the lobby for an important job interview? When all you are looking forward to is getting the ordeal over with and you can have your life back? Well, if you ever wish to experience that feeling, just pop in Safe. Two hours never felt so long. Who needs chemicals when you have this? Guaranteed to induce a catatonic state.